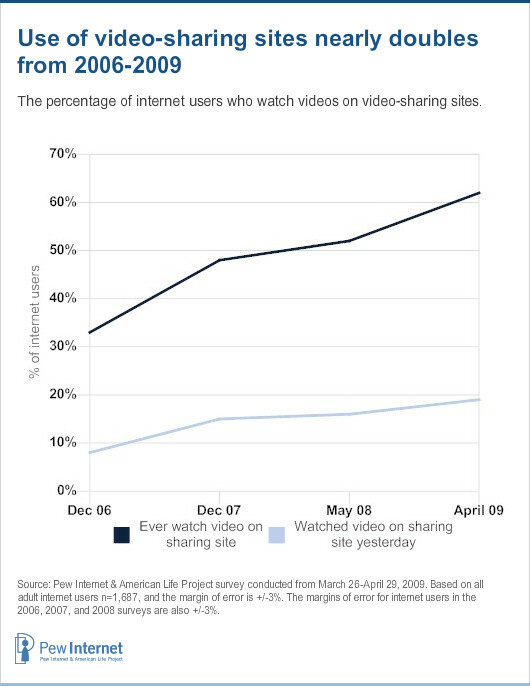 The share of online adults who watch videos on video-sharing sites has nearly doubled since 2006. The audience for online video sharing sites like YouTube and Google Video continues to grow swiftly across all demographic groups, far outpacing the adoption rates of many other internet activities. Fully 62% of adult internet users have watched a video on these sites, up from just 33% who reported this in December 2006. Online video watching among young adults is near-universal; nine in ten (89%) internet users ages 18-29 now say they watch content on video sharing sites, and 36% do so on a typical day. Over time, online video has become more deeply integrated into daily life, and has started move into the spaces that are typically reserved for traditional television viewing. 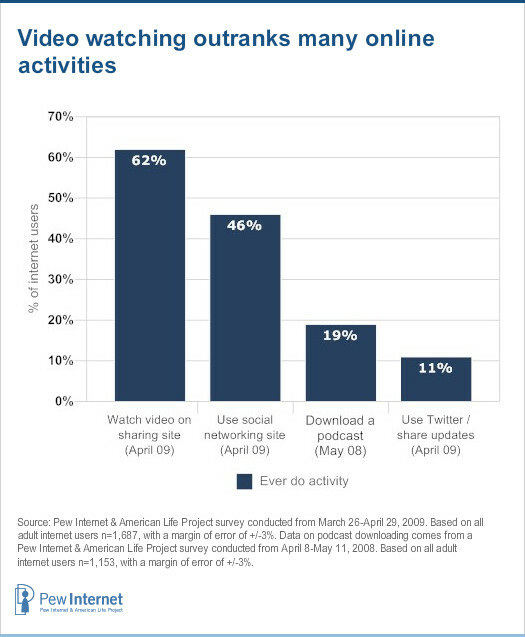 Overall, 19% of internet users say they use video sharing sites on a typical day. In comparison, just 8% of internet users reported use of the sites on a typical day in 2006. Broadband connectivity has helped to set the stage for high-quality viewing experiences and broaden the appeal of online video content. Fully 63% of American adults now have high speed connections running to their homes.1 Among broadband users, 69% watch video on sharing sites, and 23% do so on a typical day. As internet users become accustomed to regular on-demand video viewing online, many are choosing to watch from the comfort of their couch. Among those who watch TV shows or movies online, 23% say they have connected their computer to a television screen so they could view video from the internet on their TV. That amounts to roughly 8% of all internet users. These findings, which come from an April 2009 survey by the Pew Research Center’s Internet & American Life Project, illustrate the pervasiveness of online video and mark an important moment in the evolution of America’s television and movie viewing habits. Online video viewing has grown across all age groups. Young adults continue to lead the adoption curve in online video viewing. Nine in ten internet users ages 18-29 use video sharing sites, up from 72% one year ago. On a typical day in 2009, 36% of young adult internet users watched video on these sites, compared with just 30% in 2008. 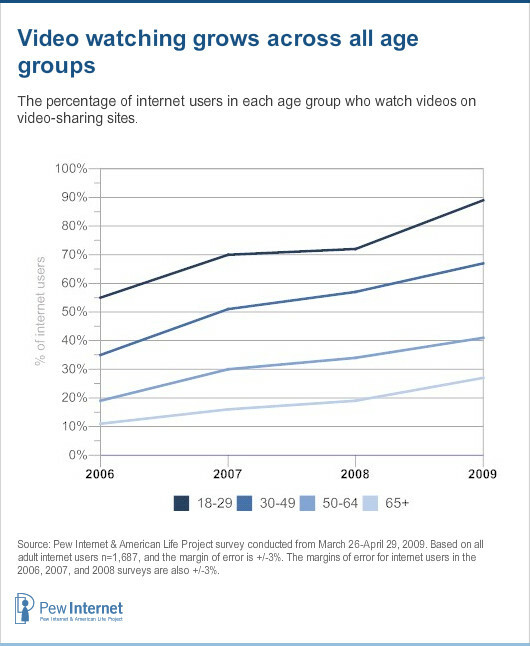 Online adults ages 30-49 also showed big gains over the past year; 67% now use video sharing sites, up from 57% in 2008. Online video viewing is still far from being the norm among internet users ages 50 and older, however, this segment of the internet audience continues to grow each year. Among internet users ages 50-64, 41% now say they watch video on sites like YouTube, which is up from 34% in 2008. Likewise, 27% of wired seniors ages 65 and older now access video on these sites, compared with just 19% who were doing so at this time last year. Over the past year, the share of online women who visit video sharing sites has grown substantially—from 46% in 2008 to 59% in the latest survey. That compares with 57% of male internet users who reported online video viewing in 2008 and 65% in 2009. On a typical day, online men are still more likely to have watched a video on sites like YouTube; 23% now report doing so compared with just 15% of online women. The latest survey found that there are now no significant differences across income or education groups when looking at the use of video sharing sites.